We all know that money’s tight in public services, not least in providing for children with disabilities. It’s not surprising local authorities want to avoid shelling out lots of money if they can get away with it. But parents are, of course, just as reluctant to let LAs get away with not providing the education to which their children are legally entitled. There is a high emotional and often financial cost to parents when they’re forced to take their LA to the First Tier SEND Tribunal to get that provision. It’s also certainly not free for the LA to defend their decision either, especially if they employ lawyers to fight their corner. So how much does it cost council SEND departments? The simple answer is that no-one knows, exactly. Not the Department for Education, not Ofsted. And whilst LA SEN managers will know roughly how much they are spending in their own domains, the costs aren’t always that easy to uncover and pin down. This post is not only about the new tribunal figures, it’s about the effort to uncover as close as possible to the real cost of Tribunal for LAs – and that’s your money too, don’t forget. 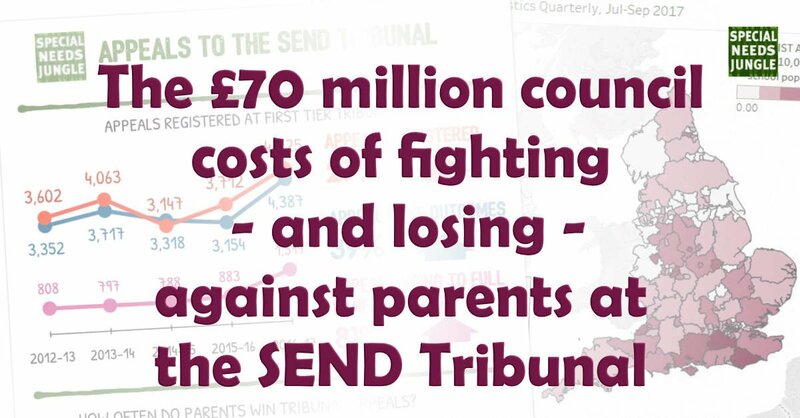 And this research, when combined with this month’s new SENDIST case data, indicates that English local authorities have probably used around £70 million of their combined resources to handle SENDIST appeals since the SEND reforms became law in September 2014 – appeals that they lost 88% of the time. 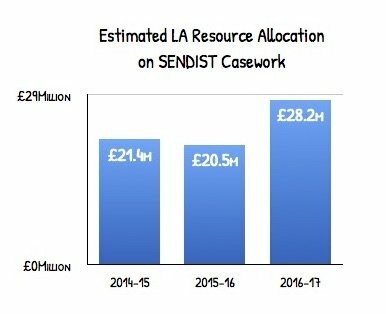 As part of their research, CEDAR asked LAs what resources they used to process and defend SENDIST appeals – not just legal costs, but management time, specialist professional time, school staff time, admin costs and mediation services. The researchers then used this survey data to estimate LA resource costs per SENDIST case – varying from around £3,500 for a simple case, through to £11,000 for a complex case that went all the way to a hearing. On the other hand, there are LAs who will lavish much more than £11,000 on some SENDIST cases – instructing, as mentioned, external solicitors or barristers, as well as commissioning expert witnesses, and sometimes taking cases to the Upper Tribunal. But a cynic would argue differently. A cynic would argue that few LAs realistically expect to win their SENDIST cases. A cynic would say that even if an LA sprays £3,500, £7,000 or £11,000 of its scarce resources on a single SENDIST case, then most of the time it’s still going to be cheaper – for them – than actually meeting the child’s needs right away, right when the child needs it. A cynic would say that this approach to SENDIST is an effective demand management tool that pays for itself – regardless of who actually pays the real price. And a cynic would say that whilst SEND accountability systems fail to learn lessons from this abhorrent waste of public money and human potential, no-one is going to stop this from happening again and again, year after year. The statistics speak for themselves: Tania’s comments & infographic. 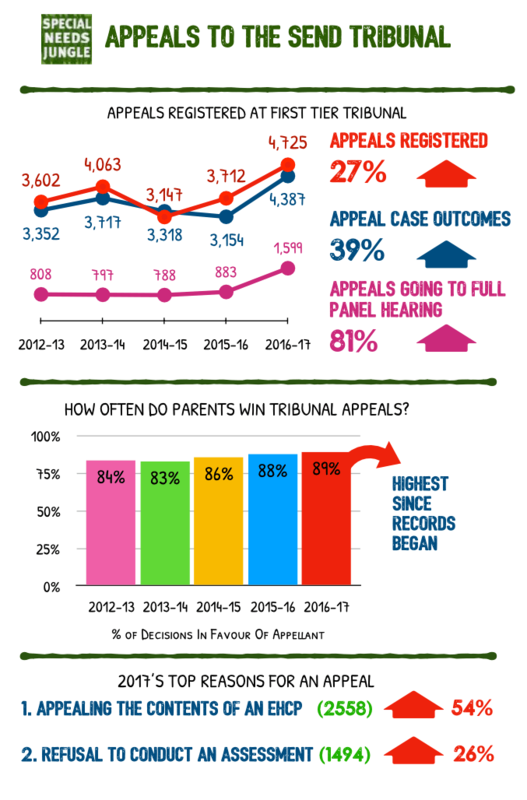 And it’s easy to see that parents not only had a lot to complain about from the way LAs are operating the post-2014 SEND system, the Tribunal judges overwhelmingly agreed with them. In the past year, there has been a 54% increase in appeals against the contents of a final Education, Health and Care Plan, to a 26% jump in appeals against an LA’s refusal to conduct a statutory assessment. It’s clear that LAs are not only trying to shirk their responsibilities but they’re also getting it horribly wrong when they do accept a plan has to be made. What a shambles! And when parents appeal, it is clear they are not doing so frivolously. 89% of appeals to the FTT are won by parents and carers. I’ll say it again: 89%. As Matt showed, that’s a lot of wasted money on Tribunals and a lot of precious wasted time for a child’s education. Back to Matt with the perp walk…. These tables rank LAs not by how many appeals they’ve had overall (on that score, Surrey, Birmingham and Kent are this year’s chumpions), but by appeal rates: how many appeals there have been for every 10,000 pupils in the LA.For the second year running, East Sussex was the LA where parents were most likely to appeal to SENDIST. That’ll come as a surprise to anyone who read the East Sussex Ofsted / CQC inspection outcome letter, which said that “the number of parents finding that they need to access tribunal decisions is significantly lower than in the past” – something that’s very hard to reconcile with the SENDIST data for East Sussex, showing more appeals than ever before.